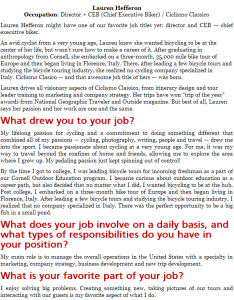 Lauren Hefferon, Founder/CEO of the award-winning travel company Ciclismo Classico, was recently profiled by “I Want Her Job”, a website that interviews successful women from all over the world who love their jobs. Lauren drives all visionary aspects of Ciclismo Classico, from itinerary design and tour leader training to marketing and company strategy. Ciclismo Classico tours have been featured in National Geographic Traveler, Forbes, CNN, USA TODAY and Outside magazine, among others.